Give your cat indoor or outdoor freedom with added protective features including a 4-way security lock and a weather-resistant magnetic flap. The Staywell Classic cat flap range includes a Manual cat flap with tunnel (for thicker doors), a Manual cat flap without tunnel (ideal for single glazed glass) and Magetic cat flap to help keep out strays. 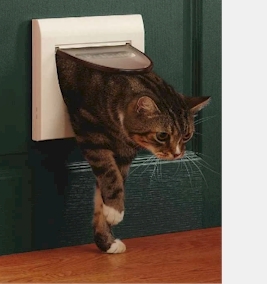 The classic cat flap is suitable for cats up to 7kg. This energy-efficient cat flap is easy to install with its universal fitting for walls and doors. Staywell Collar and key Pack Part No.REL480M For Use With Staywell REL400, REL420, REL440, Staywell 32 and Staywell 932 magnetic cat doors. Number of Keys Supplies1 Key & 1 Collar .. 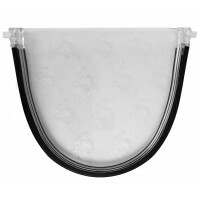 Description Tunnel Extension Available in white. Each tunnel adds 18mm (3/4") and can be clipped together to the required size. For Use With Staywell 919 only .. Description Staywell Key Pack For Use With Staywell Cat Flaps Only Part No.REL980 Contents: 2 x Keys For Use With For Use With Staywell Staywell 932, REL400, REL420, REL440 and Staywell 32 magnetic cat doors. .. Description 137mm high x 160mm wide This pack includes the flap and flap magnet For Use With Staywell 900 Series Classic Cat flaps ..
Staywell 900 Series - Spare / replacement Flap This flap is compatible with the following Staywell cat flaps Staywell 16 - Staywell 17 - Staywell 18 - Staywell 19 - Staywell 20 - Staywell 21 - Staywell 22 - Staywell 30 - Staywell 31 - Staywell 32 - Staywell 917 - Staywell 919 - Staywell 932 Thi.. Description 137mm high x 160mm wide This pack includes the polycarbonate flap and flap magnet For Use With Staywell 900 Series Classic Cat flaps ..
Stelmax 1985 Adhesive is an easily applied PVC resin and solvent based mix which bonds readily to form maintenance free joints of exceptional strength when used to bond both plasticised and rigid PVC and ABS. 1985 Adhesive is used extensively within the window industry for the installation of frames.. Please note this is the magnet which attaches to the flap. It is not a complete flap. This magnet is compatible with the following Staywell cat flaps Staywell 16 - Staywell 17 - Staywell 18 - Staywell 19 - Staywell 20 - Staywell 21 - Staywell 22 - Staywell 30 - Staywell 31 - Staywell 32 - ..